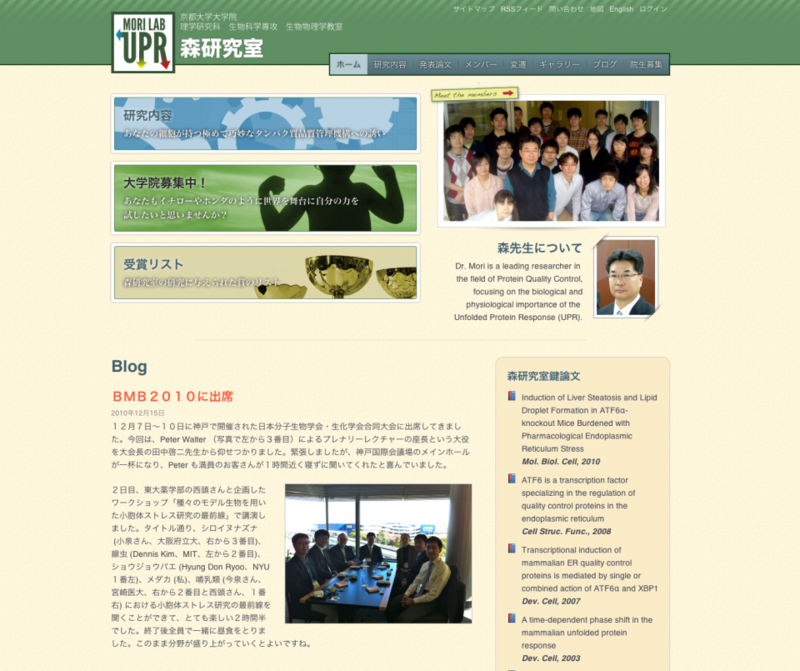 Dr. Kazutoshi Mori, like many other university laboratories, had a dedicated webspace for his laboratory website. However, simple tasks such as adding or modifying an article to the website required calling an overseas developer and waiting for content to be eventually uploaded. As a leader in research about Unfolded Protein Response (UPR), the website needed to be multilingual, easier to manage, and have a new design. Under the supervision of DMC Corp. and with regular communication with Dr. Mori, the website was quickly redesigned and moved to a content management system. Given the ease of use of the new webite, training was also completed in one training session and a few email communications. In addition to a blog, photo gallery and pages about Dr. Mori's research, the site contains a listing of all reports published under Dr. Mori's team, which can be searched by year, category, or keywords. The site is also actively used by staff members to share basic information and update their member status. As an international research laboratory, the website is available in both English and Japanese. Dr. Mori's new website was praised by staff and faculty members, as well as Dr. Mori himself, who now manages his blog and other sections of the site with ease. One of the biggest no-brainer #eecms add-on installs for me is Zenbu.